Updated at 11:11 p.m. on Tuesday, Feb. 19, 2019, with more information. KNOXVILLE — Tuesday's offensive performance may have left plenty to be desired for Tennessee. Defensively was a step in the right direction. It wasn't the perfect sort of bounce-back performance after Saturday's disappointing loss at now-fourth-ranked Kentucky, but the fifth-ranked Volunteers used an 11-2 second-half run to pull away from Vanderbilt and win 58-46 in front of 20,523 at Thompson-Boling Arena. The Vols (24-2, 12-1 Southeastern Conference) play Saturday at LSU, which plays tonight at home against Florida and is a half-game back of Tennessee in the league standings with three weeks to play. 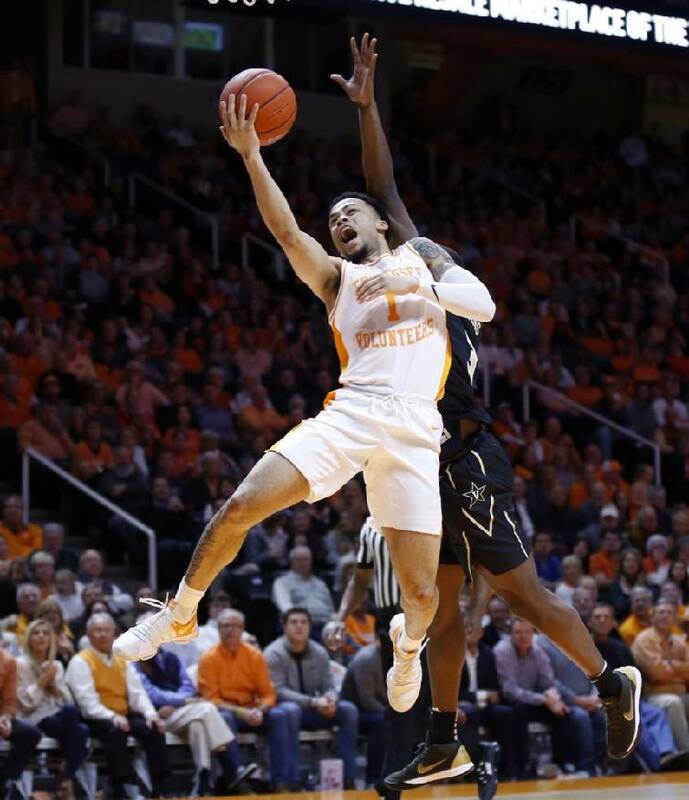 The Vols shot 41 percent for the second consecutive game but shut down the Commodores, limiting the visitors to 32 percent shooting for the game and 24 percent in the second half. That was Vanderbilt's second-worst shooting performance of the season, as it shot 31.9 percent against Kansas State on Dec. 22. 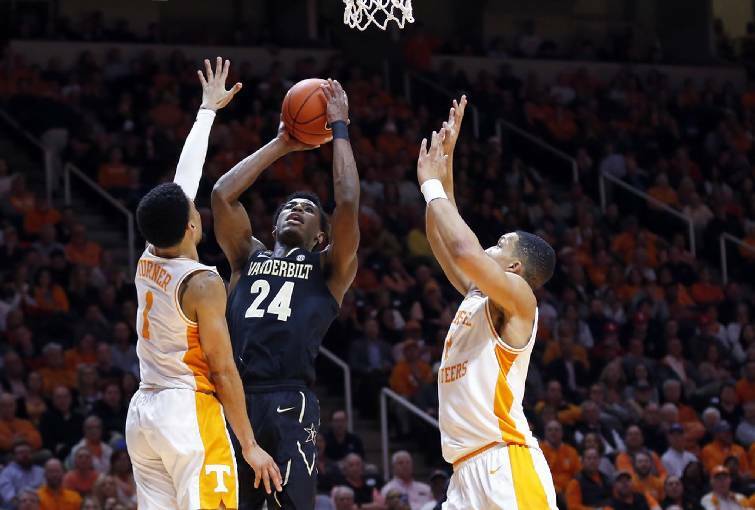 Tennessee coach Rick Barnes was pleased with the overall defense, noting that a tough, physical practice Monday set the tone for what took place against the Commodores. "I expected the guys to do what they did tonight," Barnes said. "(During the streak) I didn't think we were improving the way we needed to, and I told them, 'Sooner or later, we'll lose,' and we did. We were beaten every way we could be beaten, and they were not happy with their performance; it's why they responded the way they did when they went on the practice floor yesterday." Grant Williams had his sixth double-double of the season, finishing with 14 points and 11 rebounds, while Lamonte Turner and Admiral Schofield scored 12 points each. Jordan Bone had a team-high six assists to go with his nine points. Aaron Nesmith had 13 points to pace the Commodores (9-17, 0-13), who haven't won a game this calendar year. Their last win was on Dec. 31 against UNC Asheville. "In practice we get back to the team we are," Williams said. "We played like phonies last game and went away from what got us here, so we challenged each other in practice. We got back to defending." The Vols came out with the sort of effort that was necessary, but they appeared to be pressing at first. They started 3-for-9 from the field, while the Commodores made four consecutive shots and five of their first seven for a 13-10 lead. The Tennessee defense locked down from that point, causing misses on 10 of Vandy's final 15 attempts while forcing eight first-half turnovers to build a 14-point lead before settling on a 36-27 margin at the break. The Vols started the second half 3-for-14 from the field, allowing the Commodores to close to within 40-36 on a dunk by Saben Lee with 11:06 remaining, but the Vols responded with a big run that was predicated by the defense. They stretched the lead out to 51-38 on a Schofield 3-pointer with 6:10 to play, then fended off an 8-2 run by scoring the game's final five points. "When you hold a team to 32 percent shooting, I'd call it a good night," Turner said. "I expected my team to come out and fight defensively. We had a good practice, the energy was great and I think it was great today. "To get a win and bounce back at home feels great."